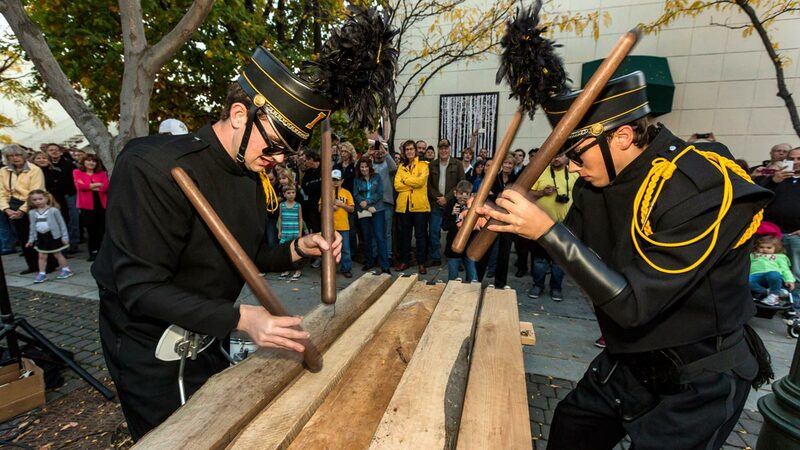 Two members of the Vandal Marching Band play the txalaparta outside of the VandalStore. Register for MusA 119 Marching Band (CRN 12906). Information about the upcoming year will be emailed to registered members (their @vandals.uidaho.edu address) during the summer. Monday, Wednesday and Friday from 12:30 to 1:20 p.m.
Tuesday and Thursday from 12:30 to 1:45 p.m.
What if I have another class during rehearsal? Class conflicts are allowed on a case-by-case basis. Contact the director if you have a potential class conflict. Do I receive credit for band? Yes. You can receive one, two or three credits for your participation. A three credit “A” can really help your GPA! Does it cost anything to be in the band? No. Everything is provided by the University except a band T-shirt, black shoes and black socks. Rehearsals begin with a brief Band Camp during the week before classes begin. Students living in the dorms are able to move into their rooms early. More information is available at the Band Camp page. The normal marching season extends through the last game, usually in late November or early December. The season occasionally extends to the end of December for bowl game performances! Two young fans look onward as the Marching Band plays. Rehearse with the Marching Band and get a feel for the experience. Drummers practice on the Admin Lawn. Joe Vandal leads the Vandal Marching Band as they parade through campus. Participate in the Homecoming parade and pregame show.